Our Distressors come pre-installed with the crucial British Mode & Image Link Options. Please see below for more details on these popular modifications. Besides offering a wide range of control and unique features, the Distressor offers a warm, vintage sound by using a custom designed gain control circuit. This "warmth" or vintage sound has become an important issue in the last 15 years, as the super clear and linear digital technology does very little (or nothing) to soften "harsh" sounds nor emphasize the bass frequencies in music sources. Older analog tape, vinyl records and tube equipment on the other hand, could not be prevented from coloring the sound, often to the frustration of recording engineers. However, many people have now realized that this coloring can be extremely pleasant and "musical".The current digital technology is often referred to as "cold" and "brittle" among other terms, although we prefer the term "unforgiving" to describe the negative side of the "linearity". 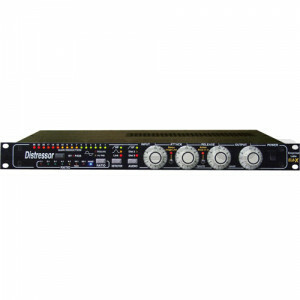 The Distressor offers several modes that color the signal, even without compression (or gain control). These extended modes were designed to allow emulation of some very old and some very expensive vintage gain control units (compressors & limiters) and deliver a classic "knee" sound all its own. The original Distressor stereo link implementation used a summing and phase detection method which allowed stereo image shifting. "Image shifting" occurs when the interchannel balance (the relative volume between Left and Right channels) changes during compression. Although known for its phase correction, and its "thickening" on open room mics and other stereo sources, this approach has sometimes been a problem on stereo program material where the producer/engineers want to maintain absolute left/right balance at all times.